The federal government has launched a consultation on the Canada Labour Code to provide federally regulated workers more flexibility in their work hours to better manage the demands of paid work and their personal and family responsibilities. 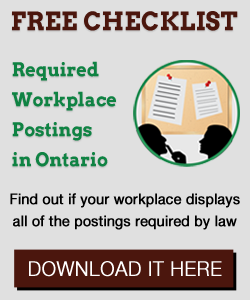 This is part of a broader overhaul of employment rules. The recent decision of Michela v. St. Thomas of Villanova Catholic School by the Ontario Court of Appeal clarified that an employer’s financial circumstances are not a relevant consideration in determining the period of reasonable notice to which a wrongfully dismissed employee is entitled. In a landmark decision that will have a major impact on labour relations in the burgeoning Ontario medical marijuana industry, the Ontario Labour Relations Board recently held that medical marijuana operations do not fall under the jurisdiction of the Labour Relations Act, 1995 (the LRA). Accordingly, employees engaged in producing medical marijuana could not unionize under the LRA as they were engaged in agriculture and therefore subject to the Agricultural Employees Protection Act, 2002. Sick employees left to twist in the wind? FAQ: Do employees in Ontario who take maternity and parental leave for the one year accrue their regular vacation as per their employment contract?